All-State Team released by WISTCA, June 21, 2012. 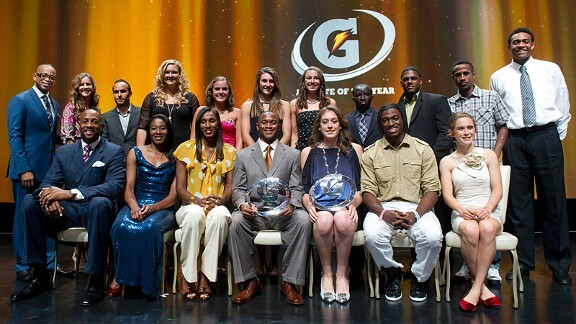 Athlete of the Year released July 23, 2012. 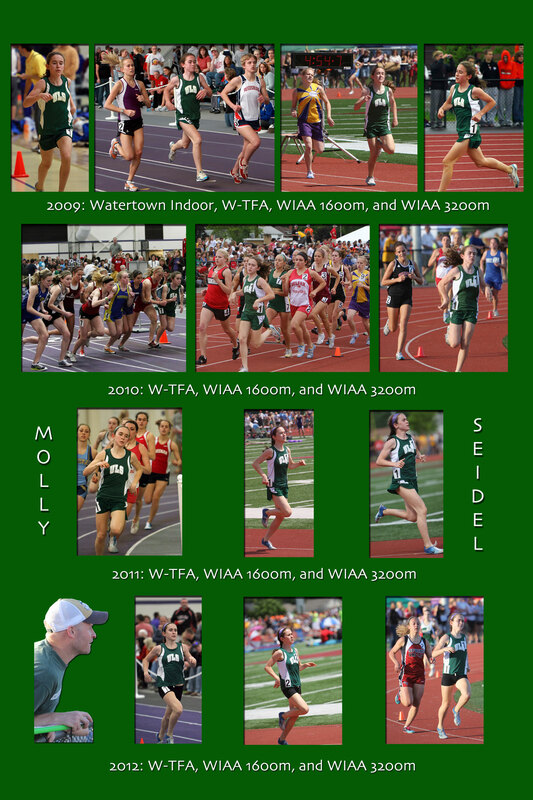 To qualify for the Wisconsin Track Coaches Association All-State Team, athletes had to finish in the top six for all three divisions combined in the finals at the WIAA State Meet 2012. 5 Ngozi Musa (FR, Divine Savior Holy Angels), 12.38; 6. Aimee Rice-Strand (SO, Osceola), 12.39. 200 Meter Dash: 1. Elexis Fuller-Stewart (SR, Milwaukee Bradley Technical), 24.12; 2. Hannah Rohde (JR, Waukesha West), 24.56; 3. Deysha Smith-Jenkins (SR, Dominican), 24.78 4 Gabby Beauvais (FR, Monona Grove), 24.86; 5. Kat Keller (SR, New Richmond), 24.94; 6. Jenni Rathsack (SR, Plymouth), 25.28. 400 Meter Dash: 1. Bonnie Draxler (SO, Wrightstown), 56.57 2 Crystal Malone (JR, Milwaukee Riverside), 57.24; 3. Cassy Goodrich (SO, Union Grove), 57.49; 4. Kat Keller (SR, New Richmond), 57.53; 5. Elizabeth Pospyhalla (JR, Edgar), 57.59; 6. Claire Gordee (SR, Wauwatosa East), 57.90. 800 Meter Run: 1. Madeline Haupert (SR, Aquinas), 2:12.73; 2. Niki Rhyan (SR, Plymouth), 2:13.80; 3. Alison Parker (JR, Neenah), 2:13.97; 4. Bridget Murphy (JR, Seymour), 2:14.58; 5. Taylor Zimprich (SR, Waunakee), 2:14.74; 6. Vanessa Boorse (SO, Wausau East), 2:14.85. 1600 Meter Run: 1. Molly Hanson (SR, Dodge/Mineral Point), 4:54.80; 2. Molly Seidel (SR, University Lake School), 4:54.81; 3. Tricia Serres (SR, Platteville), 4:55.23; 4. Delaney FitzPatrick (JR, Lakeland), 4:56.96; 5. Natalie Schudrowitz (SO, Wauwatosa East), 4:57.84; 6. Madeline Haupert (SR, La Crosse Aquinas), 4:58.38. 3. Sarah Heinemann (SR, Waunakee), 10:46.38; 4. Olivia Pratt (SR, Madison West), 10:47.15; 5. Andrea Ostenso (JR, Ladysmith), 10:48.78; 6. Elizabeth Flatley (SO, Brookfield Central), 10:53.75. 100 Meter Hurdles: 1. Elexis Fuller-Stewart (SR, Milwaukee Bradley Technical), 14.02; 2. Danielle Riggins (SO, Kenosha Tremper ), 14.47. 3. Valerie Thames (JR, Milwaukee Riverside University), 14.53; 4. Amber Sanderson (SR, La Crosse Logan), 14.54; 5. Kaitlyn Hastings (JR, Catholic Memorial), 14.70; 6. Cathy Brunette (JR, Grafton), 14.80. 300 Meter Hurdles: 1. Michelle Garner (SR, Greenfield), 43.69; 2. Amber Sanderson (SR, La Crosse Logan), 43.75; 3. Valerie Thames (JR, Milwaukee Riverside), 44.37: 3. Jenny Hagen (SR, Milwaukee Pius XI), 44.37; 5. Jean Wedwick (SR, Sauk Prairie), 45.04; 6. Jen Anderson (SO, Bay Port), 45.18. 4x100 Meter Relay: 1. Milwaukee Rufus King, 48.75 (Sydnee Matthew SO, Marissa Cosey SO, Jaia Howard SO, Alexis Redd-Triggs SO); 2. Edgar, 49.21. (Kelsey Steinke SR, Jena Heidmann SR, Faryn Wirkus SR, Kira Dittman JR); 3. Osceola, 49.28 (Sydney Rossow SR, Alexa Stokes JR, Rachael Mickelson SR, Aimee Rice-Strand SO); 4. Middleton 49.37 (Maren Guenther SR, Hanna Docter FR, Adaeze Okoli SR, Kayla Stiles JR); 5. Wisconsin Lutheran 49.40 (Hannah Kren JR, Sara Hirschmann SR, Erica Hallmann SO, Ambria Avery JR); 6. Xavier, 49.57 (Lillian Johnson JR, Kelsey Worachek SO, Paige Van Asten SR, Kate Weyenberg SR). 4x200 Meter Relay: 1. La Crosse Logan, 1:41.03. (Imani Paul SR, Tore Washa FR, Chloe Malin FR, Amber Sanderson SR); 2. Hamilton, 1:41.21, (Toney Lock JR, Ashley Holicek SR, Ellen Buckley SR, Jessica Rupnow SR); 3. Racine Case, 1:43.01. (JaToya Woods SR, Paula Kuiper SR, Breanna Hopkins SR, Bennisha Nunn SO); 4. Waukesha West, 1:43.47 (Meghann Ameen SR, Leah Lloyd FR, Caiti McCormick SR, Hannah Rohde JR); 5. Verona Area, 1:44.03. (Shannon Kerrigan FR, Ashley Bartow SR, Katy Miller JR, Lexy Richardson SO); 6. Edgar, 1:44.48 (Kelsey Steinke SR, Faryn Wirkus SR, Holly Denfeld JR, Jena Heidmann SR). 4x400 Meter Relay: 1. Milwaukee Riverside University, 3:53.07 (Angel Malone FR, Helen Thames FR, Valerie Thames JR, Crystal Malone JR); 2. West Bend West, 3:54.50 (Candice Wayne SR, Alexis Wolf SO, Kayla Janto JR, Erica Wanie SO); 3. Verona Area, 3:56.20 (Jenni LaCroix SO, Kayla Anderson SR, Katy Miller JR, Ashley Bartow SR); 4. Hamilton, 3:57.34 (Ellen Buckley SR, Ashlyn Paulson FR, Katie Pollari SO, Jessica Rupnow SR); 5. Neenah, 3:59.28 (Jessica Parker SO, Lydia Fahrenkrug SR, Jennifer Parker SO, Courtney Pitts SR); 6. Grafton, 3:59.81. (Katelyn Gallun JR, Anya Dillahunt SO, Hannah Weber FR, Sara Grange JR). 4x800 Meter Relay: 1. Neenah, 9:00.42 (Claire Knaus JR, Jennifer Parker SO, Jessica Parker SO, Alison Parker JR); 2. Arrowhead. 9:19.48 (Tayler McCormack JR, Teagan Seneczko SR, Taylor McDowell SR, Jackie Dubnicka SO); 3. Platteville, 9:21.84 (Allie Serres FR, Laura Donovan JR, Julia Lawinger JR, Tricia Serres SR); 4. Wausau West, 9:23.76 (Michaela Matushak SR, Ellie Hrdina JR, Sarah Poirier SR, Marissa Matushak SO); 5. Freedom, 9:24.75 (Alison Bos JR, Kendra Johnson JR, Lauren Peters FR, Liz Bloy JR); 6. Oconomowoc, 9:25.51. (Olivia Radtke JR, Hannah Heidvogal SR, Carly Hall SR, Mandy Prom SR). Shot Put: 1. Kennedy Blahnik (SO, Algoma), 47-11.00; 2. Kailee Kamps (SR. Belmont), 45-07.25; 3. Shavana Talbert (SR, Fond du Lac), 44-00.00; 4. Jamie Clark (SR, Shawano Community), 43-00.50; 5. Molly Griep (SR, Whitewater), 42-07.75; 6. Kayla Brown (SR, La Crosse Logan), 42-04.75. Discus Throw: 1. Kennedy Blahnik (SO, Algoma), 146-03; 2. Corinne Franz (JR, Madison Memorial), 137-04; 3. Kailee Kamps (SR, Belmont), 132-11; 4. Abbey Ristow (SR, Ellsworth), 129-04; 5. Jamie Clark (SR, Shawano Community), 129-02; 6. Katy Rutz (SR, Amherst), 127-07. Long Jump: 1. Bryzena Santos (SO, East Troy), 18-06.50; 2. Kanesha Freiberg (SO, Madison La Follette), 18-01.25; 3. 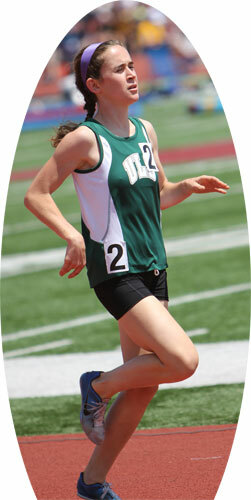 Hannah Kren (JR, Wisconsin Lutheran), 18-00.25; 4. Ngozi Musa (FR, Divine Savior Holy Angels), 17-11.50; 5. Tatiana Rice (SR, Gale-Ettrick-Trempealeau), 17-08.75; 6. Gabby Beauvais (FR, Monona Grove), 17-06.50. Triple Jump: 1. Stefani Friedenfels (JR, Menomonie), 38-06.25; 2. Alisha Harper (SO, Brookfield East), 37-08.25; 3. Mikayla Robertson (JR, Menomonee Falls), 37-06.75; 4. Allison Calkins (SO, Janesville Craig), 37-01.75; 5. Jerica Kotarak (FR, Muskego), 36-07.25; 6. Natisha Hiedeman (FR, Green Bay Southwest), 36-05.00. High Jump: 1. Lauren Ineichen (SR, Westosha Central), 5-06.00; 1. Meghan Niemann (SR, Kettle Moraine Lutheran), 5-06.00: 3. Emily Brinker (JR, Baraboo), 5-05.00; 3. Kasey Ederer (SR, Kaukauna), 5-05.00; 5. Taylor DePerry (SR, Shawano), 5-04.00; 5. Kellan Flynn (SR, Tomahawk), 5-04.00; 5. Sarah Krig (JR, Somerset), 5-04.00; 5. Alexis McKeever (SO, Mukwonago), 5-04.00; 5. Nicole Motkowski (SO, Peshtigo), 5-04.00; 5. Bryton Nyman (SO, Lake Mills), 5-04.00; 5. 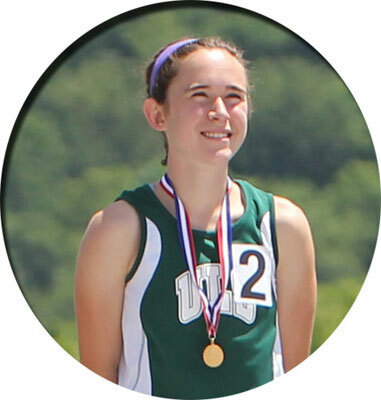 Jessie Welch (SR, West Salem), 5-04.00; 5. Audra Winter (SR, Manitowoc Lutheran), 5' 04.00; 5. Taylor Wissbrocker (JR, Rhinelander), 5-04.00. Pole Vault: 1. Bonnie Draxler (SO, Wrightstown), 12-07.00; 2. Alex Flucke (JR, Ashwaubenon), 12-06.00; 3. Cami Gilson (SR, Arrowhead), 12-06.00; 4. Faryn Wirkus (SR, Edgar), 11-09.00; 5. Taylor Corkum (JR Wisconsin Lutheran), 11-06.00; 6. Nicole Larson (JR, West Allis Central), 11-03.00. University Lake School graduate and Notre Dame recruit Molly Seidel was named Female Athlete of the Year by the Wisconsin Track Coaches Association. Seidel finished her high school career joining Joanna Schultz [Homen, 2003-2006, 200m & 400m dash events] as one of two girl athletes to win the same two events in all four years at the WIAA State Meet. At the 2012 State Meet Seidel [below right] set a D3 record in the 3200m with a time of 10.21.93. This broke the D3 record of 10:33.15 which she set in 2011. At this years State Meet Seidel [below left] also won the 1600m run in 4:54.81. She holds the D3 State Record of 4:51.54 which she set in 2011. Seidel is #3 on the All-Time Top 50 list in the 1600m run [4:44.42]. Brooke Novak [4:43.20] and Suzy Favor [4:43.79] are 1-2 on the Top 50 1600m list. In the 3200m run Seidel is #1 on the Top 50 All-Time list with a time of 10:09.89. In addition Seidel won the D3 Cross Country State Championship four times. On December 10, 2011, she won a National Championship at the Foot Locker Meet in San Diego.